Upper Deck football cards were first produced in 1990, after the Upper Deck Company obtained a license from the National Football League. Upper Deck also produces licensed cards for the NBA, NHL and MLB. With literally thousands of cards available, it�s hard for a potential football card collector to know where to start. Hopefully, the list and descriptions below will give you a solid understanding of what Upper Deck has to offer in the way of football cards. 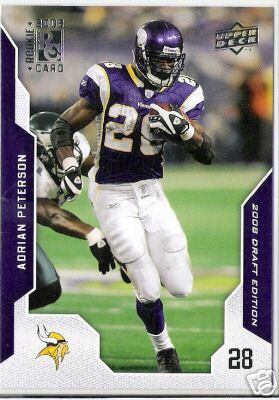 This 250-card set is the first to highlight all of the top rookies from the 2008 NFL Draft class. Athletes are included in their college uniforms, and many of the cards are autographed. This includes players such as Chris Long, Matt Ryan, Darren McFadden and Rashard Mendenhall. Each box of cards contains at least five rookie autographs. Rookie Exclusive parallel cards have serial numbers and average two per box. There are also rare signed cards from duos like Andre Woodson/Brian Brohm and Darren McFadden/Felix Jones. Autographed insert parallels include such titles as �Conference Clashes,� �Pigskin Pairings,� �Campus Combos� and �Franchise Foundations.� Dual-signed cards are numbered to 25, while Gold and Platinum are limited to 10 and 1, respectively. And in addition to the rookies, there are also 100 NFL Veterans cards. These include veteran NFL stars such as LaDainian Tomlinson, Tony Romo and Eli Manning. In addition, there�s the �Alumni Association,� which pairs up players from the same alma mater, such as Reggie Bush/Matt Leinart and Braylon Edwards/Tom Brady. These cards retail for $5.99 per 10-card pack. A box of cards contains 16 packs. One of the high-end products for card collectors, a six-card box of the NFL Exquisites retails for $600. Inside, you�ll find a minimum of three limited-edition signed cards, a patch card and a jersey card. There are also rare signed cards from the likes of Barry Sanders, Joe Namath, Joe Montana and Emmitt Smith. 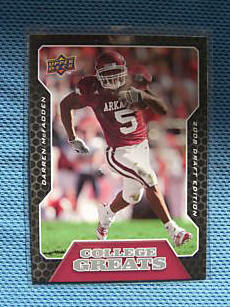 Rookie cards are also included, with names like Kevin Kolb, Adrian Peterson and Calvin Johnson. Upper Deck is also offering a special surprise for a few lucky customers. They are randomly inserting 15 �Gold� boxes which feature gold writing on the inside and are sequentially numbered. Each of the six cards in these boxes will be ultra-rare 1-of-1 cards. It doesn�t get any more exclusive than that. This Upper Deck set contains 51 cards dedicated to the 2008 Super Bowl-winning New York Giants. Stars such as Eli Manning, Plaxico Burress and Michael Strahan are all represented, as well as lesser-known players like Zak DeOssie, Chris Snee and Fred Robbins. The regular cards in this set have a print run of 625 and include such stars as Larry Fitzgerald, Carson Palmer, Terrell Owens, Tom Brady and Randy Moss. Each NFL team has three players represented in the set. Cards feature part of a football in the foreground, with Astroturf bordering the sides of the card. The player is featured down the center of the card, with their team colors included in the background. Sweet Spot Pigskin Dual Signatures feature players in interesting combinations. Sweet Spot Pigskin Signatures Tier 2 Silver 49 feature cards with actual pigskin on the border and in the middle. The center pigskin actually takes the shape of a football, and that�s where you�ll find the players signature. On the right side of the card, you�ll also find an image of the player. Limited to a 49-card print run, these feature stars such as Brandon Jacobs, Frank Gore, Marion Barber III and Peyton Manning. NFL legends are also included, with cards from Joe Theismann and Mike Singletary. Sweet Spot Pigskin Signatures Tier 3 Silver 99 come in a print run of 99 cards and feature autographs from your favorite NFL players. Even better, the cards all contain actual pigskin on the surface. Available players include Greg Jennings, T.J. Houshmandzadeh, John Lynch and Reggie Wayne. The same feature can also be found on the more limited Sweet Spot Pigskin Signatures Tier 1 Gold 15 cards. Even more limited are the Sweet Spot Pigskin Signatures Tier 1 Gold 5 cards. Other tiers are also available in various card runs. Sweet Spot Signatures Tier 1 Gold 15 come in a print run of 15, and they feature autographs from some of today�s hottest stars. The autographs can be found inside the large helmet on the left of the card, while the player�s image dominates the right side. Featured players include Brett Favre, Adrian Peterson, Drew Brees and Emmitt Smith. More cards like this can be found in the Sweet Spot Signatures Tier 2 Silver 49 set, which has a 49-card print run. Also, don�t overlook the 99-card run of Sweet Spot Signatures Tier 3 Silver 99. The Sweet Swatch Jersey cards feature actual pieces of game jerseys from players like Adam Vinatieri, Brian Urlacher, Donovan McNabb and Hines Ward. Future superstars such as Ted Ginn Jr., JaMarcus Russell and Dwayne Jarrett are also included. Sweet Swatch Patch Parallel cards offer another interesting twist on this concept. The Sweet Spot Rookie Signatures cards come in various tiers and runs, but all cards feature autographs from select members of the 2007 draft class. This includes players such as LaRon Landry, Zach Miller, Amobi Okoye and Joe Thomas. The basic cards in this set have a print run of 299 and feature various NFL stars in action. You�ll find cards such as Edgerrin James, Jake Delhomme, Braylon Edwards and Roy Williams. The 1,000 Yard Duals cards feature a pair of 1,000 yard players. Cards include Roger Craig/Frank Gore, Julius Jones/Willie Parker and Emmitt Smith/Gale Sayers. Most are limited to a 10-card run, while the Chester Taylor/Cadillac Williams card is limited to only a 3-card run. In addition, there are the 1,000 Yard Quads and 1,000 Yard Trios. As you might imagine, one series features four 1,000 yard players, while the other features a trio. You might be lucky enough to get your hands on Emmitt Smith/Barry Sanders/Larry Johnson/LaDainian Tomlinson, or you might end up with Willie Parker/Julius Jones/Larry Johnson. For fans of NFL quarterbacks, we have 4,000 Yard Duels, 4,000 Yard Quads and 4,000 Yard Trios. As with the runners, each card features a combination of quarterbacks who have passed for over 4,000 yards in a season. Players in this set include Joe Namath, Dan Marino, John Elway, Marc Bulger and Drew Brees. If you like brief player bios, then you�ll want to check out the Biography of a Legend, Biography of a Rookie and Biography of a Star cards. Each one includes the player�s autograph, plus a brief bio summing up their career. These cards range from Hall of Famers like Joe Montana, to NFL rookies like Paul Posluszny and Patrick Willis. For player signatures, you can�t beat the Chirography Signatures, Chirography Duals, Chirography Trios and Fab Four. You�ll get plenty of bang for your buck with the last two, as they contain signatures of up to four NFL stars on one card. The Football Heroes set contains more NFL players in action poses. Card runs vary from card to card, with Greg Olsen having a 99-card run to Marcus Allen�s 4-card run. The NFL Imagery cards also feature your favorite stars in action. The Generations Trios cards are really cool, as they feature three players from the same team or position but different generations. For example, Ken Stabler/Bo Jackson/JaMarcus Russell and Mike Singletary/L.C. Greenwood/Patrick Willis. Immortal Duals and Immortal Trios cards contain a mind-blowing number of NFL legends. You�ll get players like Drew Pearson, Jim Kelly and Gale Sayers. Many of these are limited to a 5-card run. Other available cards include: Notable Notations, Signature Backs, Signature Champions, Signature Numbers, Signature Quarterbacks, Signature Receivers, Signs of Defense, The Immortals and many, many more. With Upper Deck, the card series are endless. Upper Deck is by far the most prodigious producer of football trading cards on today’s market.